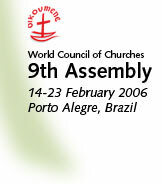 Below is one of a selection articles found in an attempt to gauge the impact in the media of the WCC's 9th Assembly. Since it appeared in an independent publication, this article neither represents nor necessarily reflects the official policy of the World Council of Churches. PORTO ALEGRE, Brazil (UMNS) - Churches must "respond to the reality of living in a world terrorized by fear" and then use their resources to provide a guide for peace and reconciliation. That is part of a statement on terrorism, one of a series of statements on public issues adopted near the end of the Feb. 14-23 World Council of Churches 9th Assembly in Porto Alegre, Brazil. United Methodists and Methodists from around the world were among the assembly participants.